Awesome. The birds kinda look like flying cats, though. I enjoy the way this comic relentlessly celebrates the arts. Nice work. Perfection in a comic. Love love. Wow, thanks for all the comments! 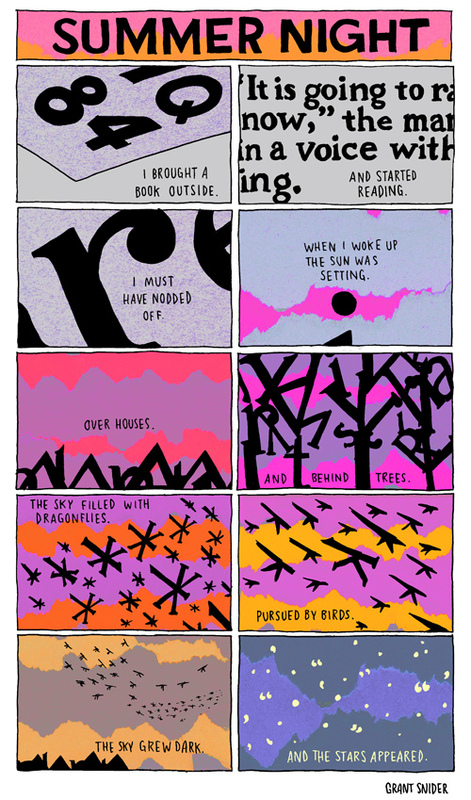 Re: flying cats - stay tuned for my next Murakami-inspired comic. it was very surprising for me to see this since I am in the middle of the same book. It's less than 1ft away now. My favorite author. Very attractive comic. I love it! My friend printed and showed me this on our flight to Boracay. It just left me amazed with your skills and the colors you used (mostly pink and purple, I love it!). Then she sent me this link. I really enjoyed my summer nights because of this.